Tmt. J. Innocent Divya I.A.S. 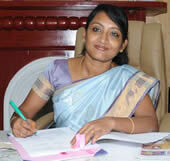 Tmt.J.Innocent Divya IAS, District Collector and District Magistrate, The Nilgiris is an IAS officer belonging to the 2009 batch. She has completed graduation in B.FSc. She took charge on 10.07.2017 as District Collector/District Magistrate of The Nilgiris District. As Collector of the Nilgiris, her important priorities are Environment conservation and Protection of the fragile and unique Nilgiris Biosphere and improving the basic amenities, particularly of the vulnerable Tribal groups indigenous to the Nilgiris District.